This listing is for 10 Woodland Soap Party Favors (2 soaps each) in your custom colors and scents and includes customized tags perfect for a woodland themed baby shower, birthday party, Fall and Winter parties, Christmas thank you favors and more! 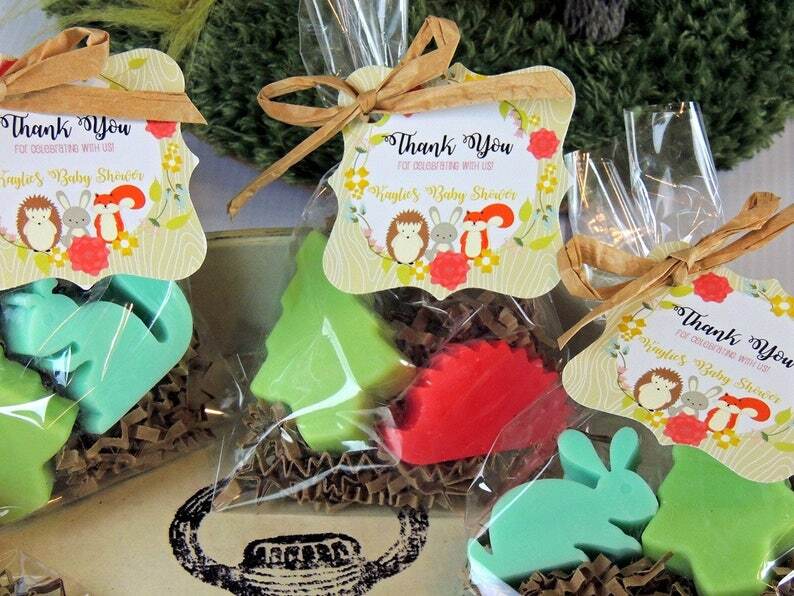 Each Soap favor includes two adorable soaps ( a Tree and one assorted animal either a squirrel, bunny or hedgehog). The tree measures apx. 2" tall and each animal is about 1 1/2" and 1/2" thick - combined weight of the two soaps is apx. 1.2 oz. 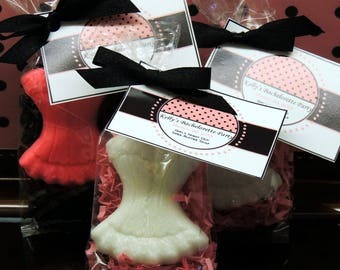 Each soap favor will be individually packaged and contain 2 soaps (a tree and one assorted animal) nestled in paper shred and packaged in a cellophane bag with tie and customized tag . For the tags you can use one the generic tag shown, or if you would like us to coordinate with an invitation or partyware, feel free to send us a jpg and we'll create a tag just for you! 1) Message for tag and name(s), if any. 2) Soap Color(s): Choose one color for the animals and one color for the trees for each set of 10 you order. 3) Scent: See scent list (last picture). Please choose one scent for the trees and one scent for the animals for each set of 10 you order. 6) Party Date so we can time these to arrive in plenty of time. WHEN WILL I GET MY ORDER? All soap favor orders are scheduled for production by party date typically 2 weeks before your party date. This allows time for production of your soap favors to ensure they are perfect and also allows sufficient shipping transit time so they arrive well before your party! Typically we ship no later than the Saturday one week before your party so the order usually arrives by the Monday before your party. ***You may request an earlier ship date - just check with us first BEFORE ORDERING to ensure there is sufficient time to make your order and ship it to you. Tracking information will be e-mailed to your Etsy e-mail address when your order ships. ****Please be sure to type all custom information required in the NOTES TO SELLER AT CHECK-OUT***. We will not schedule your order for production until all custom specifics are provided. If we need to contact you, we will do so by sending a convo to your etsy e-mail address.